For other uses, see Forty-Eighters (disambiguation). Carl Schurz in 1860. A participant of the 1848 revolution in Germany, he immigrated to the United States and became a US senator. The Forty-Eighters were Europeans who participated in or supported the revolutions of 1848 that swept Europe. In the German states, the Forty-Eighters favored unification of the German people, a more democratic government, and guarantees of human rights. Disappointed at the failure of the revolution to bring about the reform of the system of government in Germany or the Austrian Empire and sometimes on the government's wanted list because of their involvement in the revolution, they gave up their old lives to try again abroad. Many emigrated to the United States, the United Kingdom, and Australia after the revolutions failed. These emigrants included Germans, Czechs, Hungarians, and others. Many were respected and politically active, wealthy, and well-educated. A large number went on to be very successful in their new countries. After being advised by Bernhard Eunom Philippi among others, Karl Anwandter emigrated to Chile following the failed revolution. In 1850 he settled in Valdivia. He was joined there by numerous other German immigrants of the period. Germans migrated to developing midwestern and southern cities, developing the beer and wine industries in several locations, and advancing journalism; others developed thriving agricultural communities. Galveston, Texas was a port of entry to many Forty-Eighters. Some settled there and in Houston, but many settled in the Texas Hill Country in the vicinity of Fredericksburg. Due to their liberal ideals, they strongly opposed Texas's secession in 1861. In the Bellville area of Austin County, another destination for Forty-Eighters, the German precincts voted decisively against the secession ordinance. More than 30,000 Forty-Eighters settled in what became called the Over-the-Rhine neighborhood of Cincinnati, Ohio. There they helped define the distinct German culture of the neighborhood, but in some cases also brought a rebellious nature with them from Germany. Cincinnati was the southern terminus of the Miami and Erie Canal, and large numbers of emigrants from modern Germany, beginning with the Forty-Eighters, followed the canal north to settle available land in western Ohio. In the Cincinnati riot of 1853, in which one demonstrator was killed, Forty-Eighters violently protested the visit of the papal emissary Cardinal Gaetano Bedini, who had repressed revolutionaries in the Papal States in 1849. Protests took place also in 1854; Forty-Eighters were held responsible for the killing of two law enforcement officers in the two events. Many German Forty-Eighters settled in Milwaukee, Wisconsin, helping solidify that city's progressive political bent and cultural Deutschtum. The Acht-und-vierzigers and their descendants contributed to the development of that city's long Socialist political tradition. Others settled throughout the state. In the United States, most Forty-Eighters opposed nativism and slavery, in keeping with the liberal ideals that had led them to flee Europe. In the Camp Jackson Affair in St. Louis, Missouri, a large force of German volunteers helped prevent Confederate forces from seizing the government arsenal just prior to the beginning of the American Civil War. About two hundred thousand German-born soldiers enlisted in the Union Army, ultimately forming about 10% of the North’s entire armed forces. 13,000 Germans served in Union Volunteer Regiments from New York alone. After the Civil War, Forty-Eighters supported improved labor laws and working conditions. They also advanced the country's cultural and intellectual development in such fields as education, the arts, medicine, journalism, and business. 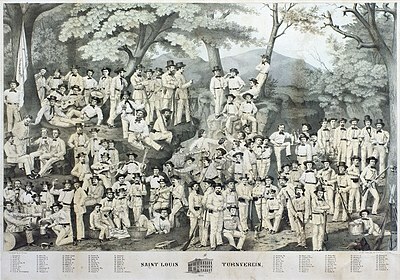 Many were members of the Turner movement. Businessmen, investment bankers: Solomon Loeb, Abraham Kuhn founders of Kuhn, Loeb & Co.
Other: Margarethe Schurz (founder of the first kindergarten in the U.S.); Al Sieber (known as "Chief of the Scouts" in Arizona, who fought at Antietam, Fredericksburg, and Chancellorsville with Hecker, Schurz, and Sigel, and then in the Battle of Gettysburg); Joseph Spiegel (founder of the Spiegel Catalog); Hugo Wesendonck (founder of the Germania Life Insurance Company, now The Guardian Life Insurance Company of America); Pauline Wunderlich (fought at the Dresden barricades); John Michael Maisch (father of adequate pharmaceutical legislation). George Kilgen, organ builder, saw hard service as a soldier where he was a compatriot of Gen. Franz Sigel and Carl Schurz in the revolutions of 1847-48. He was banished from his native country Germany and first located in New York City. Later he relocated his business to St. Louis. The Princess Louise left Hamburg March 26 of 1849, in the spring, bound for South Australia via Rio de Janeiro. The voyage took 135 days which was considered slow but nevertheless the Princess Louise berthed at Port Adelaide on August 7, 1849 with 161 emigres, including Johann Friedrich Mosel. Johann, born in 1827 in Berlin in the duchy of Brandenburg had taken three weeks to travel from his home to the departure point of the 350 tonne vessel at Hamburg. This voyage had been well planned by two of the founding passengers, brothers Richard and Otto Schomburgk who had been implicated in the revolution. Otto had been jailed in 1847 for his activities as a student revolutionary. The brothers along with others including Frau von Kreussler and D. Meucke formed a migration group, the South Australian Colonisation Society, one of many similar groups forming throughout Germany at the time. Sponsored by the scientist geologist Leopold von Buch, the society chartered the Princess Louise to sail to South Australia. The passengers were mainly middle-class professionals, academics, musicians, artists, architects, engineers, artisans and apprentices, and were among the core of liberal radicals, disillusioned with events in Germany. Many Germans became vintners or worked in the wine industry; others founded Lutheran churches. By 1860, for example, about 70 German families lived in Germantown, Victoria. (When World War I broke out, the town was renamed Grovedale.) In Adelaide, a German Club was founded in 1854 which played a major role in society. Ludwig Bamberger settled in Paris and worked in a bank from 1852 until the amnesty of 1866 allowed him to return to Germany. Carl Schurz was in France for a time before moving on to England. He stayed there with Adolf Strodtmann. Anton Heinrich Springer visited France. Ludwig Bamberger was in the Netherlands for a time, as were Heinrich Bernhard Oppenheim and Anton Heinrich Springer. Friedrich Beust settled in Switzerland to work in early-childhood education. He lived and worked there until his death in 1899. Albert Dulk, a dramatist, settled in Geneva after touring the Orient. He eventually returned to Germany. Gottfried Kinkel moved to Switzerland in 1866 after living in England. He was a professor of archaeology and the history of art at the Polytechnikum in Zürich, where he died sixteen years later. Hermann Köchly first fled to Brussels in 1849. In 1851, he was appointed professor of classical philology at the University of Zürich. By 1864, he was back in Germany as a professor at the University of Heidelberg. Johannes Scherr, novelist and literary critic, fled to Switzerland and eventually became a professor at the Polytechnikum in Zurich. Richard Wagner, the composer, first fled to Paris and then settled in Zurich. He eventually returned to Germany. Giuseppe Mazzini used London as a place of refuge before and after the revolutions of 1848. In the early years after the failure of the revolutions of 1848, a group of German Forty-Eighters and others met in a salon organized by Baroness Méry von Bruiningk and her husband Ludolf August von Bruiningk in St. John's Wood, England. The baroness was a Russian of German descent who was sympathetic with the goals of the revolutionaries. Guests included Carl Schurz, Gottfried and Johanna Kinkel, Ferdinand Freiligrath, Alexander Herzen, Louis Blanc, Malwida von Meysenbug, Adolf Strodtmann, Johannes and Bertha Ronge, Alexander Schimmelfennig, Wilhelm Loewe-Kalbe and Heinrich Bernhard Oppenheim. Other Germans who fled to the United Kingdom for a time were Ludwig Bamberger, Arnold Ruge, Alexandre Ledru-Rollin and Franz Sigel. Along with several of the above, Sabine Freitag also lists Gustav Adolf Techow, Eduard Meyen, Graf Oskar von Reichenbach, Josef Fickler and Amand Goegg. Karl Blind became a writer in Great Britain. Bohemian Anton Heinrich Springer was in England for a time during his years of exile. Hungarian refugee Gustav Zerffi became a British citizen and worked as a historian in London. Lajos Kossuth, a Hungarian revolutionary, toured England & Scotland and then the United States. He returned to Great Britain, where he formed a government in exile for Hungary. French refugees Louis Blanc, Pierre Leroux, and Louis-Nicolas Ménard found relief in Great Britain for a time. In addition, the British possession of Heligoland was a destination for refugees, for example Rudolf Dulon. Christine Lattek, Revolutionary refugees: German socialism in Britain, 1840–1860, Routledge, 2006. Daniel Nagel, Von republikanischen Deutschen zu deutsch-amerikanischen Republikanern. Ein Beitrag zum Identitätswandel der deutschen Achtundvierziger in den Vereinigten Staaten 1850–1861. Röhrig: St. Ingbert, 2012. ^ Charles Christopher Jackson: Austin County from the Handbook of Texas Online. Retrieved December 23, 2008..
^ James F. Connelly (1960). The visit of Archbishop Gaetano Bedini to the United States of America: June 1853 – February 1854. Editrice Pontificia Università Gregoriana. p. 96ff. ISBN 88-7652-082-1. Retrieved 2010-10-25. ^ Holzman, Hani M. The German Forty-eighters and the Socialists in Milwaukee: A Social Psychological Study of Assimilation, 1948 University of Wisconsin thesis. ^ Williams, Scott. "THE ROLE OF GERMAN IMMIGRANTS IN CIVIL WAR – MISSOURI". The Missouri Civil War Museum. Archived from the original on March 3, 2012. Retrieved January 10, 2011. ^ Wilson, J. G.; Fiske, J., eds. (1900). "Burger, Louis" . Appletons' Cyclopædia of American Biography. New York: D. Appleton. ^ "Girsch, Frederick". Dictionary of American Biography. IV, Part 1. New York: Charles Scribner's Sons. 1959. pp. 322–3. ^ "Solger, Reinhold". Dictionary of American Biography. IX, Part 1. New York: Charles Scribner's Sons. 1963. pp. 392–3. ^ Marmer, H. A. (1960). "Hassaurek, Friedrich". Dictionary of American Biography. IV, Part 2. New York: Charles Scribner's Sons. pp. 383–384. ^ "Rapp, Wilhelm". American National Biography. New York: Oxford University Press. 1999. ^ Zucker, Adolf Edward (1963). "Schnauffer, Carl Heinrich". Dictionary of American Biography. VIII, Part 2. New York: Charles Scribner's Sons. pp. 444–445. ^ Wilson, J. G.; Fiske, J., eds. (1900). "Sigel, Franz" . Appletons' Cyclopædia of American Biography. New York: D. Appleton. ^ Wilson, J. G.; Fiske, J., eds. (1892). "Krackowizer, Ernest" . Appletons' Cyclopædia of American Biography. New York: D. Appleton. ^ Wilson, J. G.; Fiske, J., eds. (1889). "Weber, Gustav C. E." . Appletons' Cyclopædia of American Biography. New York: D. Appleton. ; "Weber, Gustav Carl Erich". Dictionary of American Biography. X, Part 1. New York: Charles Scribner's Sons. 1964. pp. 581–2. ^ "Krez, Konrad". Dictionary of American Biography. V, Part 2. New York: Charles Scribner's Sons. 1961. pp. 505–6. ^ Wittke (1952), pp. 89–90. ^ The Board's List, reel 2459, GRK; fiche 851, Germans on Bounty Ships, GRK. ^ a b c Chisholm, Hugh, ed. (1911). "Bamberger, Ludwig" . Encyclopædia Britannica (11th ed.). Cambridge University Press. ^ See Chapter XII of Volume One of his Reminiscences. 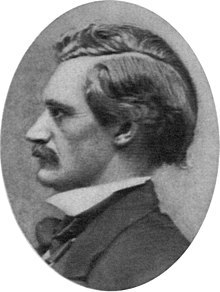 ^ Carl Schurz. Reminiscences. Vol. 1, Chap. 13. ^ Hermann Baron Bruiningk, Das Geschlecht von Bruiningk in Livland, Riga: N. Kymmels, 1913, table of contents. ^ Carl Schurz. Reminiscences. Vol. 1, Chap. 13, p. 371. ^ Sabine Freitag, German Historical Institute in London, Exiles from European revolutions: refugees in mid-Victorian England, Berghahn Books, 2003. This page was last edited on 7 March 2019, at 21:31 (UTC).